The lumbering armadillo-like woodlouse and the fleet-footed silverfish are surprisingly common, though often overlooked, visitors in our homes. Though both share a liking for cool, dark, damp hiding places beneath sinks or at the back of cupboards and despite a superficially similar appearance, in many ways they could not be more different. Fittingly, both the level of nuisance they pose and the best methods to deal with them reflect this. Woodlice are not insects, but a kind of crustacean – related to crabs, lobsters and prawns – and need moist conditions to survive. Despite their name, they do not damage wood; though in nature they may often be found in and under rotting logs and principally live on decaying vegetable matter and fungi, although they may occasionally attack the shoots and roots of seedling plants. 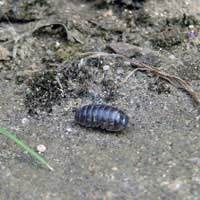 Normally to be encountered outside, hiding during the day in cool, dark and damp nooks and crannies under stones or beneath old wood, woodlice sometimes enter homes, particularly with the onset of cold weather in the winter. If drought or heavy rainfall affects their normal hiding places this may also trigger an invasion. Contrary to a common belief, they do not come inside to breed, but simply in search of shelter – though in modern, centrally heated houses this is often their undoing, as the warm, dry conditions usually kill them off within a few days. If they find their way into relatively damper and more favourable surroundings, such as the bathroom or beneath the kitchen sink woodlice may do better, particularly if they also find a source of food. Although they are entirely harmless, apart from the small amount of damage they cause to young foliage from time to time, many people simply do not like them – especially if they arrive in large numbers. If they are viewed as a problem, there are a few measures which can help. The swiftest and perhaps kindest solution is simply to sweep or vacuum them up and return them outside where they belong. Since invading woodlice often originate from hiding places close by the house itself, removing likely sheltering spots and sealing any points of entry such as cracks or holes in the masonry, or gaps around doors or windows may help prevent them returning in the future. Drying out or turning up the heating in any areas of the house where they have been seen will either drive them away, or hasten their demise. Specialist products can be used as a last resort against woodlice, or alternatively, although they are not insects, commonly available insecticide sprays or dusts are also effective, especially if applied to likely hiding places. Silverfish are swift-running, torpedo-shaped, wingless insects around 1cm long in metallic silver with three long, thin bristles at their tail-end. They shun the light, hiding in damp, cool places in kitchen cupboards, bathrooms and underneath floors and are often only seen if surprised by a light late at night, when they have emerged to feed. They may also sometimes be found trapped in baths or basins, since they cannot climb smooth surfaces. Unlike woodlice, silverfish can cause damage around the house, since these scavengers feed on a variety of materials, with wallpaper and old books featuring as favourites on their menu. Yellowish stains, irregular patches or notches on paper are common tell-tale signs of silverfish activity, although they also commonly eat glues, tile grouting, paste and cereal crumbs. Silverfish and their eggs can often be brought into the home in cardboard boxes, old books or papers. The newly hatched young look like miniature adults. Denying them food by tidying up areas where cardboard, books or old paper are stored can be useful in controlling silverfish, but it is unlikely to be enough on its own as they can survive for a year or more without feeding. Residual insecticides are the most effective means of controlling silverfish and should be applied to all likely looking nooks and crannies under sinks, behind skirting boards, around pipes and anywhere else which might harbour them. Although the control measures outlined should prove effective, both woodlice and silverfish favour moist conditions, which may mean that their presence could also be a sign of condensation or some other form of damp. This is not entirely bad news however, since if it is the case, identifying and resolving the underlying cause – which can often mean simply improving ventilation or fixing a plumbing leak – frequently removes the pest problem too.